It is time to address this question now, i.e. when your child is still young. Here is an effort to explain financial planning for your child’s future through some well-known fables. When your child is at the finishing line, can you afford to be half-way in your race? Confused why this question is being posed to you? Think of a situation a few years from now, when your child is about to reach 18 years of age and is ready to take the first step towards higher education, you cannot afford to be short of funds. Years ago, the quick rabbit lost the race to the slow, but steady tortoise. Steady is the key in this story. 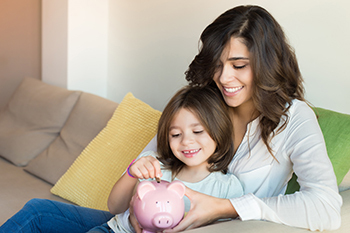 If you save consistently, the power of compounding will be your friend that will ensure that you are at the finish line before your child’s education needs reach there. All your efforts through high amount of savings in the end, will be as useless as that of a rabbit who realized a bit too late that he overslept. For example, a person who starts investing Rs50,000 monthly when his child is 3 years old, continues to invest the same amount till the child is 18 years old earning 8% interest per annum, will have a healthy corpus of Rs14.66 lakh. Compared to another person, who starts when their child is 8 years old and continues to invest Rs75,000 per month for the next 10 years earning the same 8% interest per annum will have a corpus of Rs11.73 lakh. While both have invested the same Rs7.5 lakh, the one who started early will have almost Rs3 lakh more for his child’s higher education. While drinking water in the pond, the deer admired his mighty horns but regretted having such thin legs. While the legs could have saved the deer from the attack of a lion, it was the beautiful horns which got caught in the overgrowth and the deer lost his life. While smart-looking, high-yield, fly-by schemes may look attractive, it is the hard-working steady schemes like life insurance that fulfill long-term needs, such as your child’s education. And when it is as critical as your child’s future, you have to rely on ‘handsome does’. Remember that greedy dog who saw his image in the water while crossing a river and wanted to get another piece of bread from the dog in the river? He barked at the image and lost what he had. There will always be other sellers of financial products who will try to entice you through “new, improved products” and coax you to get out of your existing long-term investment in life insurance. Resist the temptation because you could end up losing the opportunity to realize high returns in the later part of your policy when charges are low, and may end up buying a product wherein you pay a higher amount upfront once again. So, stay invested! You need resources to realize several of your child’s dreams. Like a journey that begins with a single step, instead of being overwhelmed by the responsibilities, take that one small step to reach your goal. The thirsty crow that toiled and put one pebble after another into the water pitcher, drank to his heart’s content when the water rose. Remember that story of three lambs who were told by their parents to build their own houses as they grew up. The first one built the house of straws and soon he was enjoying in lush green meadows. The second one built the house of mud and straw and joined the first one to have fun. The third one built the house with stones and cement and toiled hard for months. The first two lambs made fun of him. Sometime later when the wolf attacked them, it broke through the straw and mud house easily but not through the solid defense of third one. Same holds true for your child’s future. Build a solid protection cover that in no case your child’s future is compromised. Go for a life insurance plan that offers triple protection of lumpsum sum assured, monthly payouts and waiver of premium so that there are no regrets in future. Be the third lamb who toiled to build a solid protection though not aware of the future danger. Your child becomes the center of your universe from the day she is born. Somebody as important as your child deserves the best as she grows up. To ensure that she gets the best of education and her career aspirations are not interrupted, you should invest in your child’s future with a plan and stick to it. While you focus on the upbringing of your child, her future can be secured by your right financial decisions taken today.